Our new block insulator kit can help stabilize your extruder's temperature during changes in print cooling fan speed. 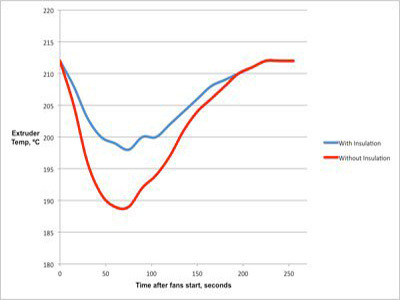 A sudden fan speed increase occurs in every Zortrax print around the end of raft printing, and when using the "Auto" fan speed setting, sudden increases in fan speed can occur at various times during a print, as determined by Z-Suite's fan control algorithm. When printing at a target temperature near the bottom of a filament's usable range, this can cause extrusion failure, especially with the V2 hot end. With the ZT-HE hot end, usable temperature range is greatly expanded and this "fan shock" effect is less of an issue, but still worth being aware of. 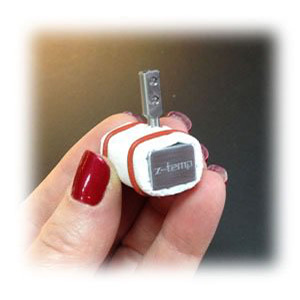 The use of the insulator is entirely optional and not required for use with the ZT-HE, but it provides a little extra peace of mind so you don't have to worry about temperature drops when printing at especially low temps. Some folks claim that it can also reduce curling of thin features due to downward heat radiation from the block. Our insulators are made of a flexible, asbestos-free alumina-oxide ceramic material, 3mm thick (twice as thick and twice as effective as other block insulation currently on the market), rated for 1200ºC, with a k-factor of 0.48, custom die-cut for a perfect fit on the ZT-HE. 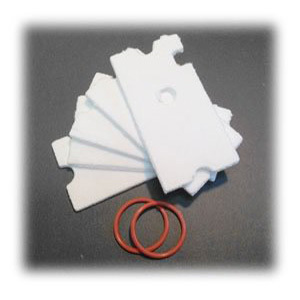 The insulator kit consists of five insulators and two high-temperature silicone o-rings. The o-rings are rated for operation to 240º and the temperature on the exterior of the insulation reaches approximately 205º. Please make sure that the o-rings do not contact any metal surfaces when installed. We recommend letting the hot end cool completely before installing the insulator.